From an overhead angle, 2 pieces of red meat with the fat cut off are shown with a knife on a cutting board, sitting on a white tile counter. 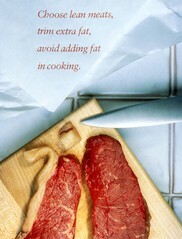 Above the image, red lettering reads: "Choose lean meats, trim extra fats, avoid adding fat in cooking". Shot on 4x5 format. This was used in the 1989 calendar "Eat for Good Health" February 1989.